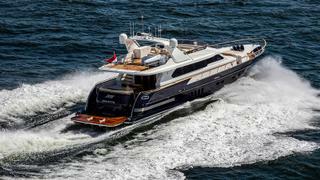 Dutch shipyard Van der Valk has delivered the latest 24.75 metre yacht in its flybridge range to the Mediterranean. The RINA classified yacht, which has been christened Joy, features a striking blue hull and sports exterior design and naval architecture by Van der Valk. The interior design meanwhile has been handled by Guido de Groot Design. 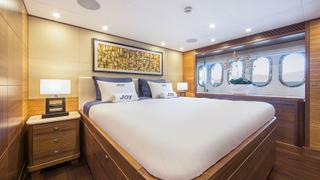 Combining “timeless design with cutting edge equipment”, Joy is built from an aluminium hull and superstructure for an owner from the shipbuilding sector. The flybridge deck includes an outdoor helm station with a co-pilot seat and enough space to accommodate a Williams Turbojet 385 tender. 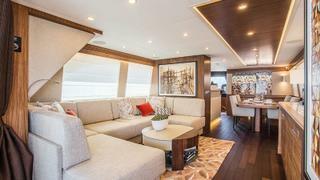 The interior design is described as “contemporary with a traditional touch” and sees the main deck populated with Pennsylvania walnut and Zebrano woods. Accommodation sits on the lower deck and comprises a full beam master stateroom, VIP suite and twin cabin. The separate full beam crew area meanwhile allows for a crew of two in two cabins and a shared bathroom. Powered by three Volvo Penta IPS800 engines with full joystick control, Joy can reach a top speed of 23 knots and cruising speed of 18.4 knots.